The masked Islamic State militant known as “Jihadi John”, who has been pictured in the videos of the beheadings of Western hostages, has been named. He is Mohammed Emwazi, a Kuwaiti-born British man in his mid-20s from West London, who was known to UK security services. They chose not to disclose his name earlier for operational reasons. Emwazi had been detained by counterterror officials in Britain at least once, in 2010. The paper also reported that Emwazi is from a well-to-do family, graduated from college with a degree in computer programming and is thought to have traveled to Syria sometime in or around 2012. He was raised in a middle-class neighborhood in London and on occasion prayed at a mosque in Greenwich. 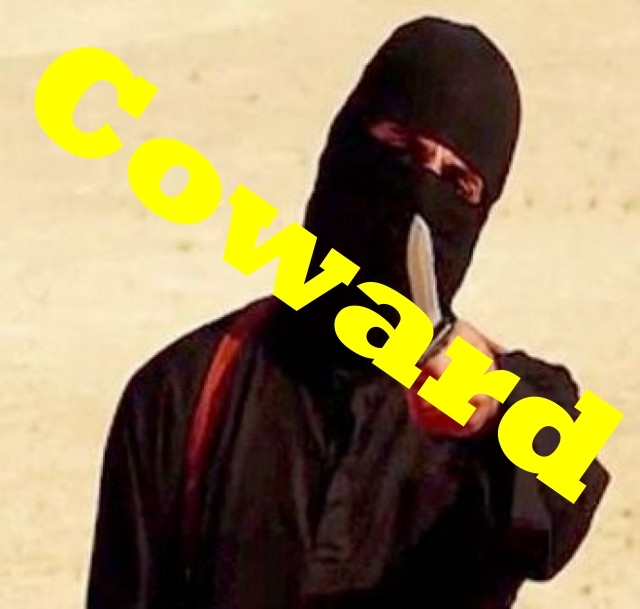 Emwazi first appeared in a video last August, when he apparently killed the American journalist James Foley. He was later thought to have been pictured in the videos of the beheadings of US journalist Steven Sotloff, British aid worker David Haines, British taxi driver Alan Henning, and American aid worker Abdul-Rahman Kassig, also known as Peter. So his mask is now worthless, and this despicable coward, who specialised in hacking the heads off other men when their hands were manacled behind them and they were defenceless can now be tracked down and killed. I hope some of the real men who make up the West’s armed forces do the job on this inhuman POS as soon as they have his location. The should feed his carcase to hungry pigs. That way he will not get any virgins. Yeah, or have a woman administer the killing shot. Has the same effect I think.